We are the only authorised UK retailer stocking the full range of Velleman electronic projects and ready assembled modules. New products are added as soon as they become available. All accessories and extras for their kits are kept in stock. (including cases, enclosures and heat sinks). We have weekly deliveries from Belgium so obtaining replacement parts or spares is a simple procedure even if you did not purchase the product from ourselves. If you are looking for a different type of project to build or want to add to an existing completed one, you need get hold of a Velleman Kit catalogue. 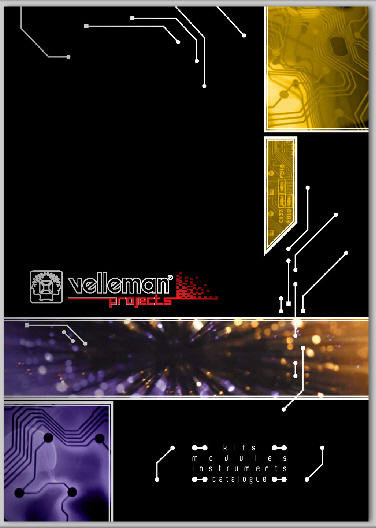 ESR Electronic Components are now offering the full range of kits and modules by Velleman.NV. The range of projects in the catalogue cater for the experienced constructor, or for the complete novice. Kits included are Amplifiers, Automotive projects, Control/Interface devices, Measurement/Test Equipment, Timers and Power Supplies. With Velleman's range of mini kits and ready assembled modules the catalogue is certainly worth a look. 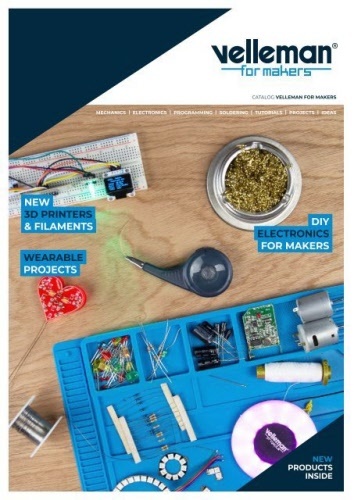 To obtain your free copy, get in touch with ESR Electronic Components or add to your shopping basket. You can also view the catalogue online.